Hey you, stop reading this old news story immediately: check out this full Parrot ANAFI review instead. Although it's long been a leader in the drone biz, French brand Parrot is probably most associated with the more 'toy' drone end of the market. With the Parrot ANAFI, it's flying much more into market leader DJI's skies. It's goal: to shoot DJI down. But not literally, obviously. That would be bad. 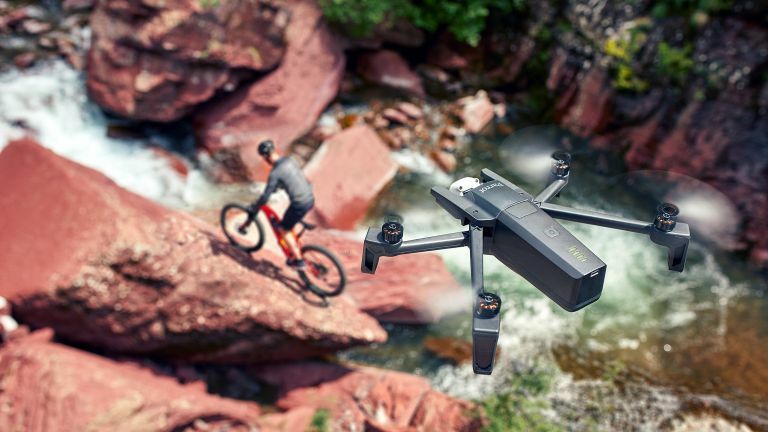 Clearly built to dogfight, commercially speaking, with the likes of the fold-up, 4K DJI Mavic Air, Parrot ANAFI is ultra portable, folding up to a compact rectangle (with an attractive carry case – Gallic flair at its finest). It weighs just 320g, thanks to a chassis of carbon fibre filled with hollow glass microbeads. It's also built to be a properly rugged, long-range video drone. The camera is a 21-megapixel, 4K number that can shoot in standard and 'cinema' (21:9 aspect ratio) Ultra HD. 21-meg stills can be taken in Jpeg or RAW format. Oh and there's a 'lossless' digital zoom as well. It's the first ultra-portable drone to boast a a 180-degree, vertically-rotating camera. Folding up and unfolding is completely simple, with no buttons to push or knobs to turn. It comes bundled with the equally quick to unfurl Parrot Skycontroller 3, into which you slot your phone for joystick navigation control and visual feedback. Charging via USB C, ANAFI flies for up to 25 minutes and, using GPS and 'smart battery' tech, returns to you when the juice is running low. ANAFI has a wide-angle (110º) camera mounted on a 3-axis gimbal which gives mechanical stabilisation, in addition to digital stabilisation via the app. The gimbal has a vertical tilt of fully -90° to + 90° as well as being able to look -40° to + 40° from port to starboard. By oversampling, ANAFI gains the equivalent of 2.8x lossless zoom when shooting in HD and 1.4x in 4K. You can then push that up to 3x zoom, but that will degrade the image quality slightly. Here are some sample shots taken on ANAFI-cam (not by me). So the basic hardware is very solid, but Parrot has added a bag of digital tricks, including 'Dolly Zoom', which lets you automatically zoom in on a fixed subject while moving. So with no skill required, you get an effect "used by great movie directors, such as Alfred Hitchcock or Stanley Kubrick. With four dual-band Wi-Fi antennae, one in each foot, Parrot says the ANAFI will "ensure an optimal connection with the remote control Parrot Skycontroller 3 regardless of the orientation of the drone," using a proprietary Parrot system. From what I've seen (or heard) of it, ANAFI is reasonably quiet by drone standards, and Parrot claims it is "the quietest drone in its class". There are two manual control modes. In Sport mode, ANAFI will go at up to 33mph, and take on winds up to 31mph. Film mode is, naturally, rather more sedate. Via Parrot's new FreeFlight 6 app for iOS and Android you can trigger 'SmartDronies' (a selfie mode) so you can take shots like this absolute doofus. You can also have the drone follow you as you parkour, mountain bike or stagger drunkenly through the urban or rural wilderness. Well, I don't know about you, but I'm now exhausted.